It’s all very well brewing fancy IPAs and delicious Coffee Porters, but the one thing my homebrew cupboard was missing was a good session bitter. 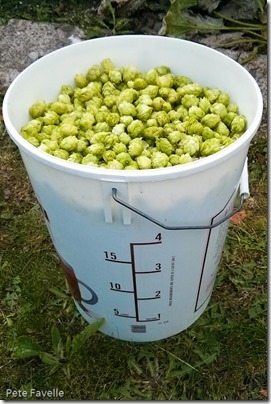 I also had an alarming quantity of Bramling Cross hops from the garden. When I bought myself a hop plant, I didn’t really appreciate the volume of hops that a single plant can produce. The weight alone doesn’t sound huge; this year’s crop is a little over 2 kilos but the sheer volume is astounding. 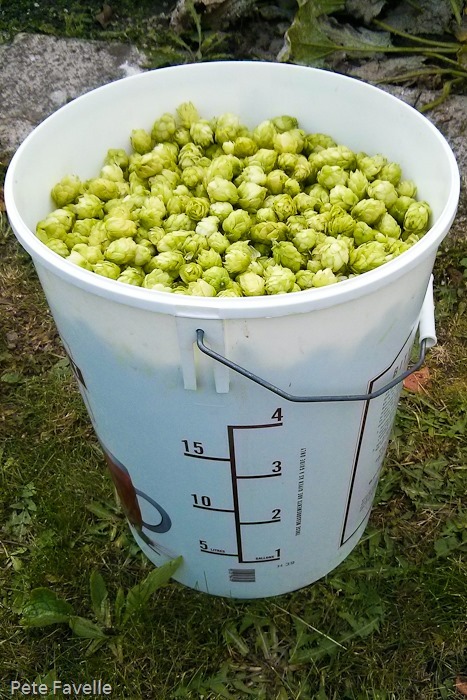 That’s a 5 gallon fermenter full of hops, and there’s still a few handfuls of cones on the plant. With this in mind, I decided to brew a single-hop Best Bitter, using my Bramling Cross. This highlighted another problem with home grown hops – I have no idea what their bittering qualities are. Hops you buy always have an alpha acid percentage on the packet; simply put, this is a measure of how bitter they are, which in turn allows you to put together your recipe. When they’re fresh from your own garden, however, there’s no easy way to check. I made an assumption that my hops were averagely bitter for the variety (6.5% AA) and came up with a fairly basic recipe that should be close to a “standard” bitter – 3.7% ABV, and an IBU of 27. The brew day itself was fairly trouble-free; mashing at my normal 65°C for an hour, a quick batch sparge and then a one hour boil – I reduced both mashing and boiling times from 90 to 60 minutes a few brews ago, and it doesn’t seem to do the beer any harm. I managed to hit the recipe target gravity of 1.036, and pitched some Nottingham yeast once everything was cooled off. Things started to go a little wrong when it came to bottling; for some reason I decided to skip the priming sugar, assuming that there would be enough residual fermentation to put at least a little condition into the beer. I honestly can’t imagine why I decided that, because it’s not exactly complicated to add a cupful of sugar to your beer before bottling – especially as this was a relatively low strength session beer that really didn’t need to spend a couple of months conditioning in the bottle before drinking. The practical upshot of this error is that the first few bottles I opened were pretty flat and, if I’m honest, disappointing. So I did what I always do with disappointing homebrew – I stuck it in the cupboard and forgot about it for a couple more months. 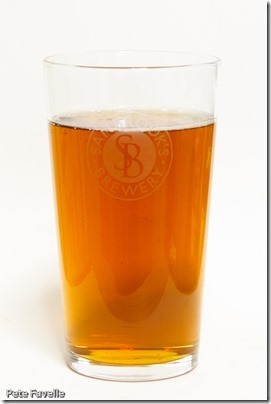 Time has improved things to an extent; it’s a decent mid-amber colour, and although there’s little or no head to be seen there are a few rising bubbles. The nose is simplistic; light toffee, with just a hint of blackberries underneath and a tiny metallic tang. In the mouth, the fizz is gentle but just about there. There’s a slight sugary sweetness, leading into a gentle, blackcurrant bitter finish. 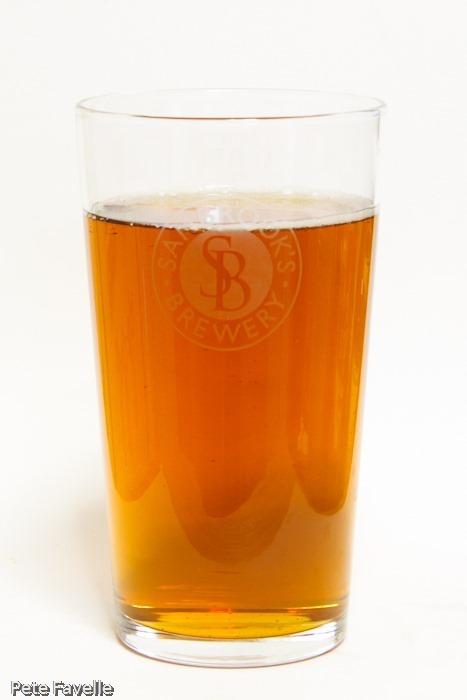 It’s light-bodied, to the point of being slightly watery, and there really isn’t a great deal of flavour going on – not helped, certainly, by the length of time it’s been sat conditioning. Overall, it’s not a bad beer. It actually reminds me of many a small regional brewer’s Best Bitter, so I suppose in that sense I’ve achieved my target. But it definitely needs tweaking, with more body and more flavour. At least I have a few kilos of hops to work through as I develop this one!